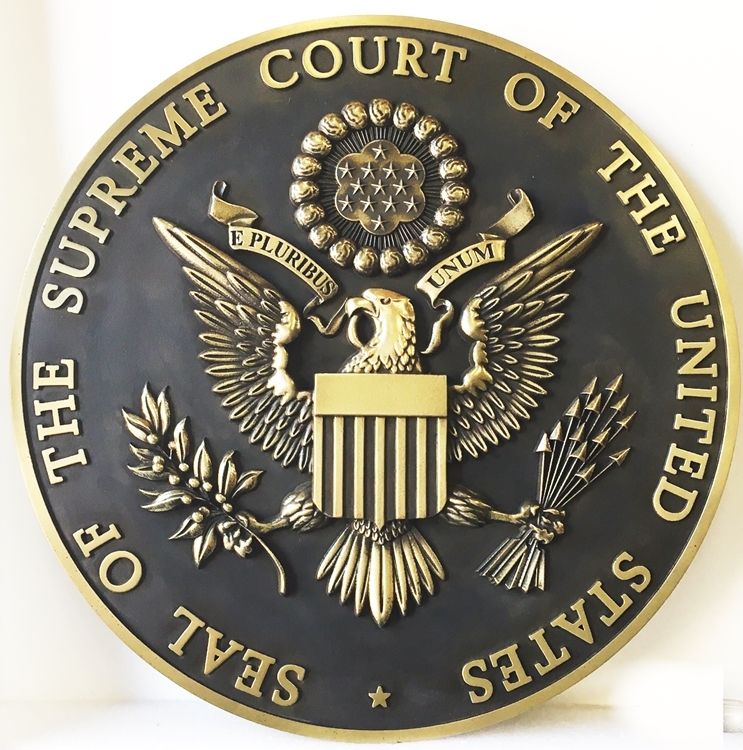 Above is a polished brass wall plaque for the Seal of the United States Supreme Court with text in the outer border. It is carved in 3-D bas-relief from High-Density-Urethane , coated with brass metal, high-polished by hand, , and then given 2 coats of clear coat For this seal, we can make a custom 3-D (sculptured bas-relief) natural or stained wood, multi-color High-Density-Urethane (HDU), or bronze or brass-coated HDU wall plaque of any size and color scheme. Please click on Gallery 30 to see over 250 other Federal government plaques and signs. We make custom and official wall plaques of the seals, emblems, logos, crests. coats-of-arms, badges and insignia of all branches, departments, agency, bureaus, commissions, and other federal government organizations in the Executive, Legislative and Judicial branches of the Federal government. If you have a seal , an emblem, a logo, a crest, a coat-of-arms, a flag, a badge or chest/ shoulder patch or insignia, we can make a 2.5-D or 3-D ( 0.5 inch relief ) wall plaque of it in any size. Our materials and surface treatments include carved wood (mahogany, cedar, maple, oak, or Redwood), full color painted High-Density-Urethane (HDU) , or metal-coated HDU (bronze, brass, copper, nickel-silver, steel, aluminum, gold, silver). finishes. See U30002, U30003 and U30004 in the top row of Gallery 30 for some examples of these finishes. We can customize or personalize these plaques with carved or raised text for individual or organization names, achievements, citations, dates, etc. These are great for entry signs, lobby or reception wall plaques, courtroom plaques, office plaques, auditorium plaques, podium plaques, organization & award plaques, retirement plaques, etc. We can make sandblasted or carved wooden or HDU signs or plaques of any design in any size from 9 inches to 120 inches, for either indoor or outdoor use. Plaques and small signs can be placed on an inside or outside wall or door, or on a desktop. Large signs can be mounted on a brick or stone monument base, an EPS monument structure, or between steel or wood posts, We can customize these plaques or signs with any shape, border, font style, or color scheme with carved (engraved) or raised text and art of your choice. For more information on design options, prices, and delivery schedules, please call us at 951-698-8484 or email us at info@artsignworks.com, and our friendly and knowledgeable customer service representatives will respond promptly. To return to Gallery 7, please click on "Return to List" below right.